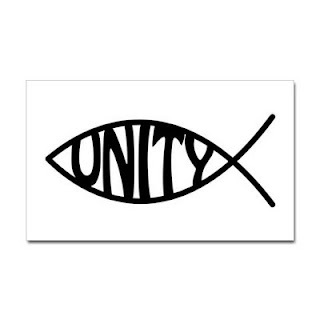 5) How do we move the church past division in theology, evangelism and mission to work towards unity in Christ? Here, the answer is flagrantly Jesus. The issues that divide us and fragment our denomination are many. We argue about homosexuality, and about how to approach people who are not Christian. We squabble about what it means for the bible to have authority in our lives together. We go at each other over pretty much everything and anything, because we're chasing after different priorities and different goals. Absent a clear sense of shared and common purpose, any organization or group will tear itself to pieces. Diversity of focus and emphasis can exist just fine within such a group, but if it's not absolutely clear that a community of human beings has a unifying purpose, that community will come apart at the seams. Here, the oldline denominational churches face a much mightier challenge than the new mainstream nondenominational churches. Nondenoms function pretty much the same way that a corporation functions, meaning they're organized around a single core product or service, with identity focused on a single board and a single iconic CEO...I mean, pastor. Establishing identity is really straightforward. Just listen to pastor-slash-brand. That holds true right up until that pastor leaves/dies/resigns after canoodling. In the oldline, we function much more like a political system. There's mess and disagreement and difference of opinion. This comes naturally to democratic systems of governance, but it doesn't give univocal organizational certainty. For that, well, we have Jesus. The question arises, of course...which Jesus? Is it the Jesus of the evangelical right, oozing plasma and corpuscles for our salvation, wrapped in Old Glory, and takin' down Satan with his FNH F2000 with a 4X ACOG sight? Or the transgendered person of color Jesus of Queer Theology? Then again, there's also the Jesus whose ethos and teaching can be fairly easily established from a plain-text reading of the Gospels. The Sermon on the Mount and the Sermon on the Plain lay out an ethic of self-giving, transformative love that's radical and cohesive. The nature of the Kingdom he proclaimed is pretty clear, particularly when you get into the implications of that Kingdom for how we are supposed to live together. When we wander outside of the synoptics into the witness of John's Gospel, we have a distinct but harmonic vision of the relationship Jesus had with God, and the relationship he expected his disciples to have with one another. This is the Jesus...formed by and speaking into the ethos of first century Jewish apocalyptic thought, while simultaneously subverting and transcending it...that pops up if you set aside your presuppositions and cultural biases. The teachings of this Jesus, if we give them authority over our lives, have the power to unite us. We resist that Jesus, of course. He's not us. He doesn't neatly fit into either side of our squabbles, and instead demands that we love those we disagree with, to the point of forgiving them even if they crucify us. If we can follow that guy? We'll still be different, of course. We won't always agree. But though different, we won't be divided. Not in the way that causes pain and brokenness.